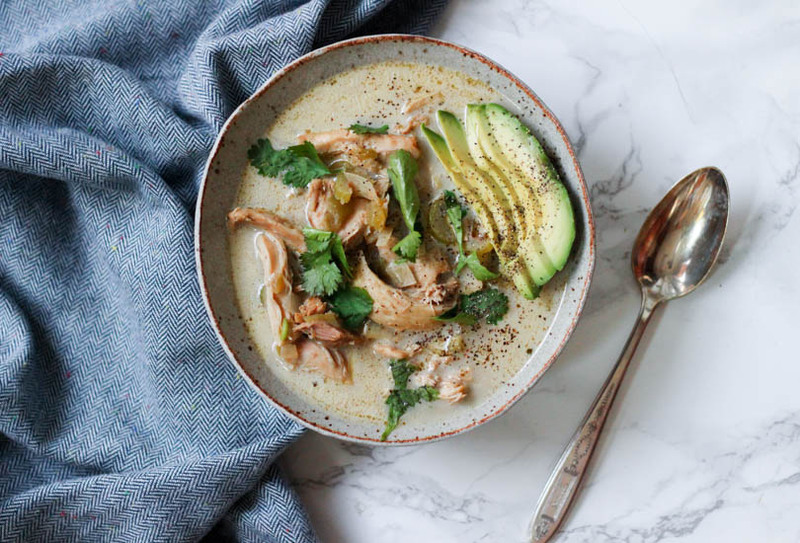 From Lauren: This recipe for Paleo White Chicken Chili is from regular contributor and fellow NTP Jean Choi. 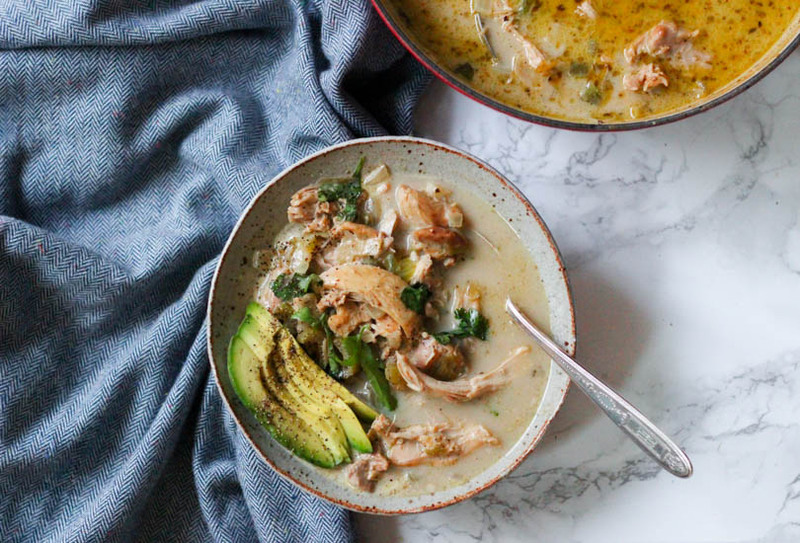 What is it about creamy soups that make us feel instantly warm, cozy and nourished? Packed with veggies and bone broth, and I just don’t know if I could survive winter without a bowl of yummy soup every few days. 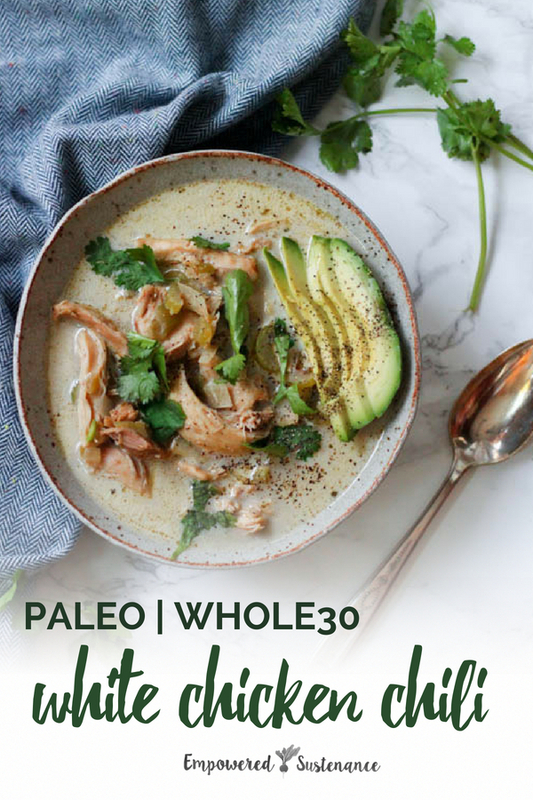 I made this Paleo White Chicken Chili twice in the past week because my husband and I couldn’t get enough of it. He even told me that he likes it better than the regular traditional chili I make, and I think I have to agree with him. It’s full of flavor from the delicious combination of spices and the shredded chicken adds a great texture that will have you forgetting that the recipe doesn’t include beans. Hope you enjoy this recipe as much as we did! Chicken Thighs or Breasts – I personally recommend chicken thighs over breasts any day, because it’s so much more tender and flavorful. However, either one will work for this recipe. Try to purchase pasture-raised chicken if you can. Diced Green Chili – You can purchase a small can of diced green chili at most grocery stores. If you prefer some extra spice, you can substitute with fire roasted diced green chili, which also comes in a can. Coconut milk – Make sure to use full-fat, canned coconut milk for the creamy texture. It won’t be the same if you use the light version! Heat coconut oil in a large pot over medium high heat. Add onion, celery, garlic, and jalapeños and cook stirring for 5 minutes. Push the veggies to the side then add the chicken with cumin, chili powder, coriander, oregano, sea salt, and black pepper. Cook the chicken for 5 minutes until the chicken is browned on all sides. Add the broth and diced green chili, and let the soup come to a boil. Lower the heat to medium low, and let it simmer for 15 minutes. Transfer the chicken to a bowl and use 2 forks to shred it completely. Add the chicken back to the soup, then add in coconut milk. Turn up the heat to medium high, then let the mixture come back to a boil. Let it boil for 10 minutes until the soup is slightly reduced and thickened. Take off heat and serve topped with your favorite garnish. can’t wait to try this, so different from the traditional recipe but still so many wonderful ingredients! Coconut milk, wow, so tasty, thank you for this recipe! I made this a few days ago and am so impressed. Adding the avocado and cilantro is genius! Delicious. I will make this again and again! 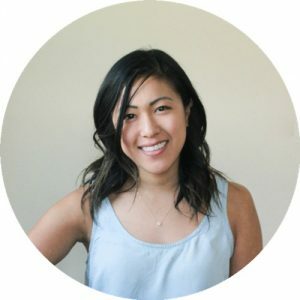 Is there a coconut flavor because of the coconut milk? I’m happy to hear you enjoy the recipe!